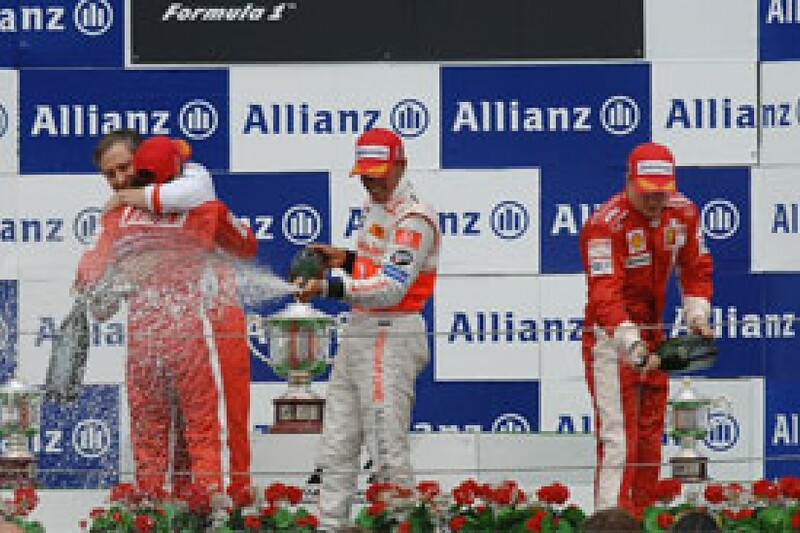 It may not have tightened the championship battle particularly - Lewis Hamilton left Magny-Cours four points further ahead - but the French Grand Prix result still gave hope that the 2007 Formula One season will return to being a four-way fight in its decisive half. Ferrari had been steadily edging back towards McLaren's tail ever since the silver cars' Monaco walkover, but Kimi Raikkonen and Felipe Massa's dominant one-two in France was still a major turnaround in form, especially for the hitherto beleaguered Raikkonen. As he celebrated victory in characteristically low-key fashion, the Finn had no qualms about conceding that he had been off the pace since Melbourne. But he hinted that he had always expected such a blip when switching teams and tyre suppliers, and could not see why his run of lacklustre results had been presented as a crisis. 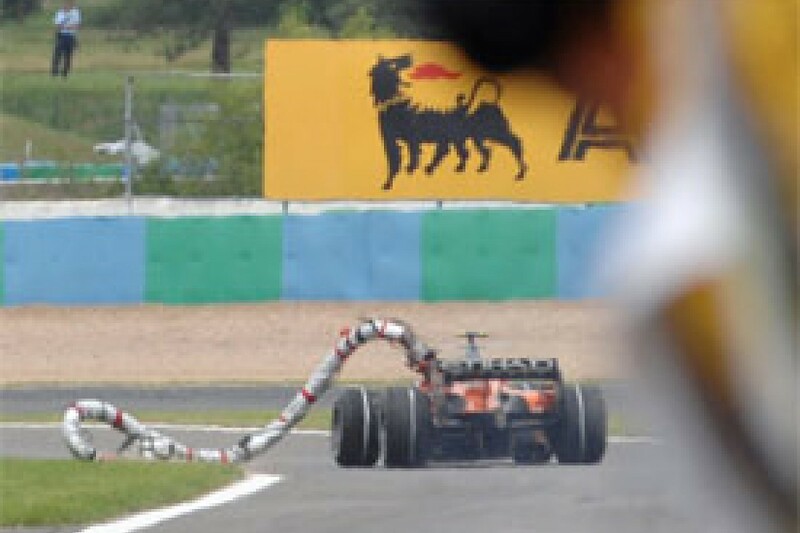 "I think we had a bit of a hard time but I kind of expected to have a bit of a difficult time," said Raikkonen. "People always think that you've lost it when you don't have a good result but we just worked hard and tried to get it right. "I think we can still improve and we're still not where we want to be. But we are definitely much happier with the car since the last test." Luca Baldisserri was similarly reluctant to present his team's Magny-Cours result as a dramatic revival: "We did not die in Indianapolis, so it is not a miracle that we are back today." But the fact remains that in France Ferrari interrupted a run of races in which McLaren had been a clear step ahead of the rest of the field. Magny-Cours has often been a fruitful location for Ferrari in recent years, and Michael Schumacher's victories in 1997, 1998 and 2006 in particular signalled the moment at which the Scuderia's title charge really came alive. In all three years, his title rivals left Magny-Cours with the unnerving knowledge that the Ferrari was now a match for them even on a 'typical' European circuit. Of course the other common denominator between those three seasons was that Ferrari ended up losing all three world titles despite their mid-championship resurgences. 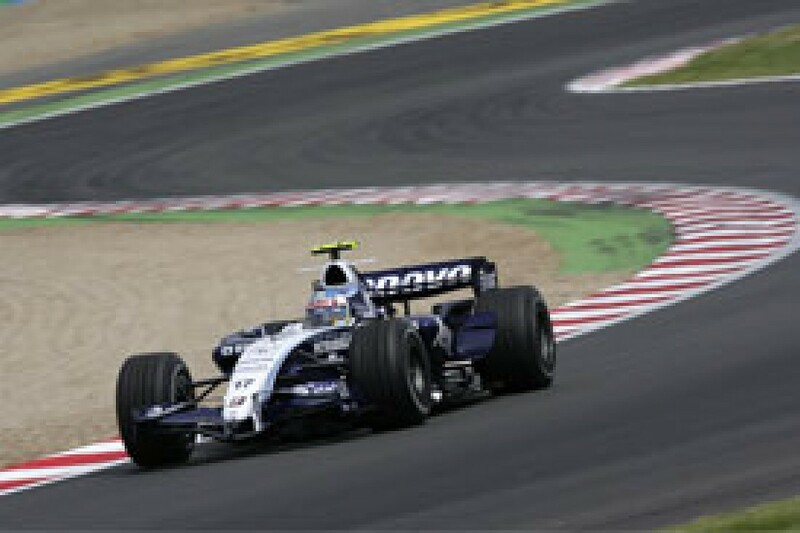 And with Massa and Raikkonen still 17 and 22 points respectively behind Lewis Hamilton, and the team 25 points behind McLaren, they still have a lot of ground to recover in 2007 even if they do maintain the edge they showed in France. Ron Dennis believed that this weekend was more a case of McLaren losing than Ferrari winning. "We flattered them this weekend," he said. "They did a good job and probably improved the car a little bit, but we made them look a lot better than they were." Seventh place did little justice to the speed and flair that Fernando Alonso had displayed during the race. Badly hamstrung by a particularly ill-timed qualifying failure - starting 10th in a light car being infinitely tougher than starting 11th in a heavy one - he didn't give up hope until the very last laps. His pass of Nick Heidfeld as they plunged into the fast Imola chicane provided further evidence that the world champion is one of the most bold and imaginative overtakers of the modern era. But his strategy then put Alonso back behind the BMW again at the end of the race. It felt like however many bold overtaking manoeuvres he produced, he was still destined to finish behind the cars he was passing. For every revitalising step forward, he was forced to take two demoralising steps back - a situation perhaps emblematic of his season at present. Meanwhile his teammate Lewis Hamilton continues to stride purposefully towards the title. Remarkably, his third place in France actually equalled his worst career F1 finish - a sobering reminder of the scale (and consistency) of his achievements in his first eight races. Fortune definitely seemed to smile on Hamilton at Magny-Cours. Like Alonso he had a technical failure - but it happened in the comparatively unimportant first practice session, and his car was recovered in time for it to be restarted for the final half hour. Alonso's failures both happened at deeply costly moments. Then while he didn't have the speed to win the race, Hamilton still had little trouble finishing third, he still out-scored his main title rival by four points, and although a Ferrari won, it was the driver furthest adrift in the standings. "The fact is that we have finished on the podium again and we are the most consistent team and I think we are doing a better job," said Hamilton. "And, I am extending my lead in the championship, so I couldn't be happier." The optimistic sounds coming out of Ferrari following the previous week's Silverstone test appeared justified as Kimi Raikkonen and Felipe Massa commanded the opening session of the Magny-Cours weekend. 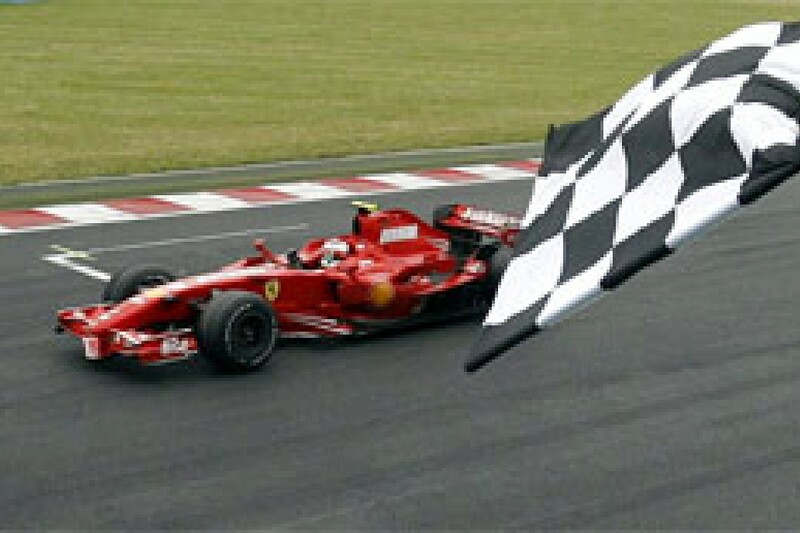 They lapped just 0.065 seconds apart - but were seven tenths clear of the rest of the field, headed by Fernando Alonso. Lewis Hamilton was only sixth, behind eye-catching performances from Williams' Nico Rosberg and Red Bull's David Coulthard, having stopped on track early on when the McLaren's engine protection system decided the Mercedes V8 was running too cool and shut the car down. It was brought back to the garage in time for him to rejoin session for the final half hour. Robert Kubica managed ninth for his first outing since his horrific Montreal crash, but only after missing the first hour of the weekend with steering problems. Ferrari remained on top in the afternoon, this time with Massa ahead of Raikkonen - who survived a big spin across the grass - by 0.035 seconds. Hamilton was fourth, surprisingly sandwiched by the two Toro Rossos. However Scott Speed and Vitantonio Liuzzi readily admitted that their respective third and fifth places were somewhat illusory. "Maybe the quick times look nicer than they are in reality," said Liuzzi, while Speed added that their fuel loads had been "on the low side" when they leaped up the order. Alonso was only eighth following a wild trip across the Imola chicane gravel and grass, but saw no reason to panic. "I think we will be stronger over the weekend than we appear today," he said. "I am not worried about the results so far." Coulthard and Rosberg continued their promising form in sixth and seventh, with Super Aguri's Anthony Davidson also impressing in ninth. 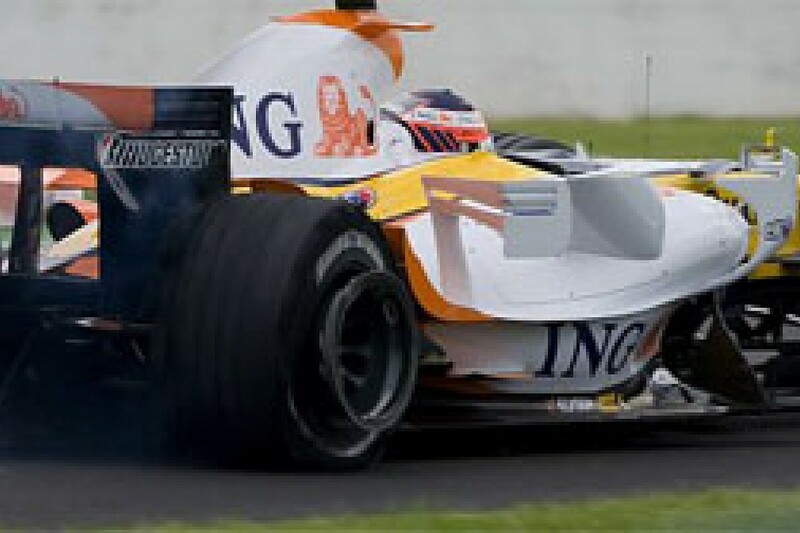 Drivers in trouble included Coulthard's teammate Mark Webber, who parked up with transmission failure, Anthony Davidson, who tagged Liuzzi exiting his pit and broke his front wing, and Christijan Albers, who damaged his Spyker on the Imola kerbs. But the most worrying problem befell Nick Heidfeld. The German had to vacate his BMW after 18 laps when the back pain that had struck during the Silverstone test reoccurred. BMW were sufficiently concerned to put Sebastian Vettel on standby, but after receiving treatment Heidfeld was fit to continue with his weekend. Hamilton ended Ferrari's run by topping final practice, but his teammate Alonso had a dreadful session, as a brake sensor problem kept him in the garage until the final two minutes. He emerged for a single lap and managed eighth after a minor error at Imola. Massa and Raikkonen were second and third, 0.063 and 0.433 seconds behind Hamilton respectively, with the Renaults fourth and fifth. Alonso's tribulations aside, the only notable incident was a seven-minute red flag stoppage caused by the artificial grass at the final chicane becoming detached and being scattered across the circuit. But while the session may have been short on action, it still promised a tense qualifying session, as just 0.945 seconds covered everyone from third-placed Raikkonen to Takuma Sato in 19th. How long the team indulges his difficulties remains to be seen, but a third successive early elimination in France was certainly the last thing Wurz needed. Down in eighteenth after his first Q1 run, he could only improve to 16th on his second - and late fast laps from Rubens Barrichello and Mark Webber then dumped him straight back outside the cut again. But Wurz tried to remain positive: "If you ignore the fact that I went out in the first round and I'm in 18th place, I'm actually much closer to my teammate here than I've been at other races and was only a tenth away from making it into Q2..."
Vitantonio Liuzzi and Anthony Davidson both felt traffic played a part in their positions after ending up 17th and 20th - with Davidson finding the final moments of the session reminiscent of a London motorway. His Super Aguri teammate Takuma Sato was 19th in the times, but would be put to the back of the grid as a delayed punishment for his yellow flag infringement in the US Grand Prix. The Spykers remained mired at the back. Christijan Albers out-qualified Adrian Sutil, who had to park with a clutch problem, but both were 1.5 seconds slower even than the Super Aguris. Following a miserable run of qualifying performances akin to Wurz's current plight, Ralf Schumacher appears to have rediscovered his one-lap pace, as he proved by cruising through to Q2 at Magny-Cours. Until the final seconds, he looked set for a Q3 place as well, but errors in the middle sector on his last lap meant he failed to improve - unlike his teammate Jarno Trulli and BMW's Nick Heidfeld, whose gains knocked Schumacher back to 11th. He would start ahead of the two Hondas, with Jenson Button 0.177 seconds quicker than Rubens Barrichello and both confident that the team's recent upgrades would pay greater dividends in the race. The remaining three Red Bull-owned cars completed the midfield. Mark Webber abandoned his first run after an error and could only manage 14th on his second. 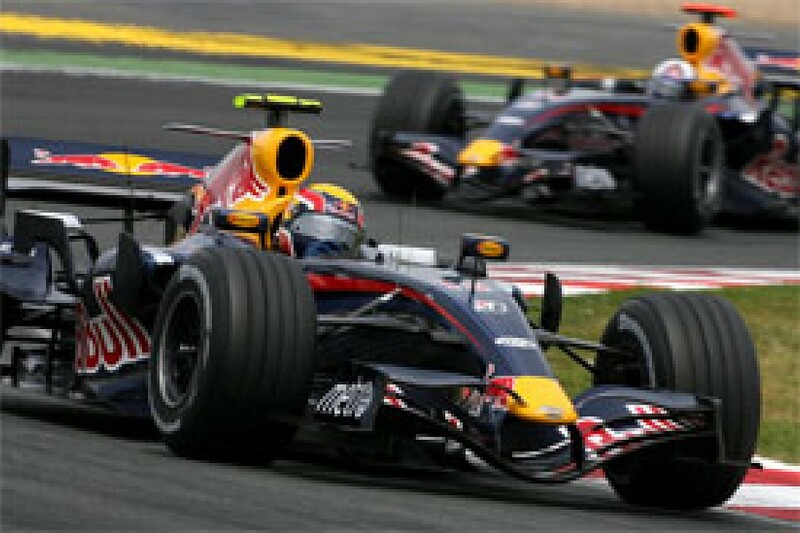 But David Coulthard didn't make it beyond his out-lap, due to what was ultimately diagnosed as an oil pressure problem. He shrugged off the RB3's continuing fragility as an inevitable consequence of Red Bull's aggressive development: "No-one in the team is deliberately designing something to fail. Everyone is working hard to try and find an edge. That is the definition of Formula One - being right on the limit." Scott Speed put his Toro Rosso between the senior team's cars in 15th - twelve places lower than he had been the previous afternoon, but no surprise to the American. "I was definitely not expecting to repeat yesterday's performance," he said. "We like to keep our feet on the ground here at Toro Rosso..."
Under real pressure from Ferrari for the first time since Spain, McLaren went into Q3 with both cars on light fuel loads. But their hopes of filling the front row were immediately dashed, as a gearbox failure hit Alonso's machine before his out-lap was even complete. He was not only condemned to 10th on the grid, but would have to start behind a group of cars fuelled significantly longer and potentially planning one pit stop less than the McLaren. Being eliminated in Q2 would have been preferable, Alonso reckoned. "I would prefer to start 11th, with the free choice of fuel loads, but that's the way it is," he said. "Up to the first pit stop it will be very, very difficult, because I have no choice with the fuel strategy." That left Hamilton to take the fight to the Ferraris. He briefly held provisional pole after his first flying lap, but then Massa deposed him with a 1:15.034. The McLaren driver improved on his second run, but only to 1:15.104 - so despite Massa making errors on his own final run, the Brazilian still secured pole position. It was his fourth of the year, but his first since Catalunya. "It looks like we're back fighting again," Massa smiled after qualifying. "I had a good lap, especially on the first try. On the second try, I just tried to over-drive a little bit and then I lost some time. Sometimes when you try to be too aggressive, it doesn't work." Hamilton felt he would have usurped Massa but for an error at the final corner of his last lap. "You can't be perfect all the time," he said. "I had the car for pole and I lost a bit of time on Turn 15. "I was about a tenth and a half up, so I had it there, but it would have been a mega lap." He remained extremely confident for the race. "I believe that we have a good strategy for tomorrow, so we will be very strong," Hamilton said. "I do believe that we still have the pace of the Ferraris, at least." Raikkonen was a further tenth adrift in third, ahead of Robert Kubica - who announced his return to the grid with the best qualifying performance of his career. His BMW teammate Heidfeld was half a second slower in seventh after encountering oversteer on his last lap. They were split by the two resurgent Renaults. Heikki Kovalainen appeared to have the edge on Giancarlo Fisichella in practice and the first two-thirds of qualifying, but then a power steering glitch made his car pull to the left in Q3. Nevertheless, he still took sixth, 0.152 seconds behind Fisichella, who was delighted by the team's recent progress. Trulli felt that he got the maximum out of the Toyota as he took eighth, while a gearbox glitch cost Nico Rosberg time on his final lap and left the Williams back in ninth - rather lower than the German's practice form had promised. Prior to the start, Lewis Hamilton had spoken of slipstreaming Felipe Massa down the long straight and grabbing the lead at the Adelaide hairpin on the opening lap. But instead he moved in the opposite direction, as both Ferraris got away better than the McLaren and Kimi Raikkonen slotted into second behind Massa as soon as the lights went out. "I don't really know what happened, but all I saw was Kimi come flying past," said Hamilton. Robert Kubica held on to fourth, while Nick Heidfeld made a faster start than the two Renaults ahead of him only to find the gaps closing in front of him. "I tried to overtake Giancarlo Fisichella on the right hand side, but he moved over, which was not correct," complained Heidfeld, who briefly put two wheels on the grass before slotting in behind Fisichella and Heikki Kovalainen. As Heidfeld slowed to avoid contact, Jarno Trulli and Nico Rosberg had to back off abruptly. This allowed Fernando Alonso to try a bold move around the outside of Rosberg at Estoril, before edging ahead of the Williams on the straight and getting alongside Trulli as well. But approaching Adelaide, Trulli braked too late and slithered past Heidfeld and straight into Kovalainen's right rear wheel. "It was a misjudgement by myself," said Trulli. "I was not attacking anyone but for whatever reason I braked too late and I hit Kovalainen. I'm really sorry for him because I spoiled his race and also my race." The Toyota crawled back to the pits to retire with bent front suspension, while the unfortunate Kovalainen had to wait until the whole field had passed before spin-turning and rejoining. A rear puncture then meant a tentative run back to the pits for repairs, and left him a minute adrift before his race had really begun. As the field dodged around the spinning Renault, Rosberg managed to get back ahead of Alonso and into seventh. There were some near-misses behind, but no further contact, with Jenson Button, Rubens Barrichello, Ralf Schumacher, Mark Webber, David Coulthard, Scott Speed and Alex Wurz completing the top fifteen. 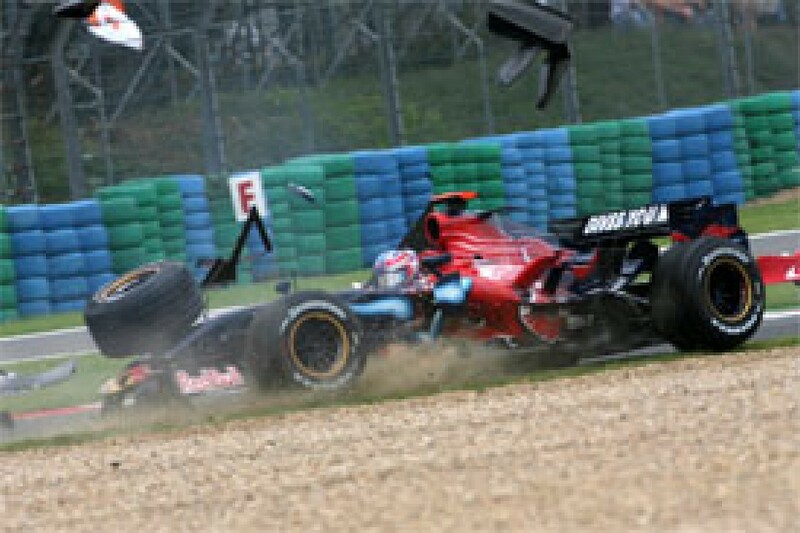 Trulli and Kovalainen were not the only drivers in trouble on the opening lap. Anthony Davidson had been caught out when the midfield concertinaed into Grande Courbe and slid into the back of Vitantonio Liuzzi. The Toro Rosso slewed sideways before spinning back across the track and collecting the Super Aguri, putting both cars out. Takuma Sato started sufficiently slowly to avoid the incident, then passed Christijan Albers for 16th further around the lap. There had been no need to overtake the other Spyker, for an electrical problem on the grid meant that Adrian Sutil had started from the pit lane in the T-car. At the front, Massa was looking imperious - setting a string of new fastest laps and building a four second lead over Raikkonen, who was being followed, but not pressured, by Hamilton. This trio quickly left Kubica a distant fourth, while the Pole pulled away from the close group of cars that Alonso was trying to hack a path through. The world champion slipped past Rosberg into Turn 15 on lap two, and briefly got ahead of Heidfeld at the same place three laps later. But the move had required some extremely late-braking, and the McLaren veered wide on the exit, allowing the BMW back through. On lap 16 it became clear just how hard a race McLaren were in for, as both Hamilton and Alonso made their first pit stops. That the crew were able to service the rookie before his teammate entered the pits showed how much time Alonso had already lost in traffic, while the fact that the McLarens were clearly running lighter than those around them proved that Hamilton would be as hard-pressed to take on the Ferraris as Alonso would be to get amongst the top five. Massa went until lap 19 before pitting for the first time, while Raikkonen ran three laps further still. The Finn's strategy seemed the strongest, for his additional low fuel laps allowed him to close to within two seconds of his race-leading teammate. Hamilton was now 10 seconds adrift, having had to spend four laps trapped behind Rosberg following his pit stop. Worse still, he remained on a three stop strategy whereas the Ferraris were now sufficiently fuelled to require just one more pit visit. 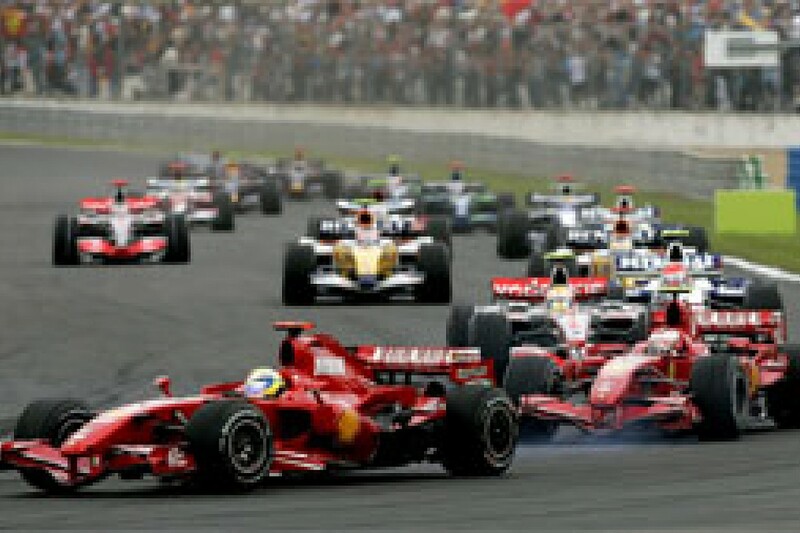 Alonso had rejoined in clear air - thanks largely to much of the midfield being trapped behind Barrichello's slow Honda. But he didn't quite gain enough ground during his out-laps, and on lap 19 Fisichella emerged from his first stop just ahead of the McLaren. They would battle vigorously for the next four laps, which was probably a factor in Heidfeld not only remaining ahead of Alonso but also jumping Fisichella when he stopped on lap 22. The McLaren made it past the Renault into Adelaide on the following lap, and was soon back on Heidfeld's tail. 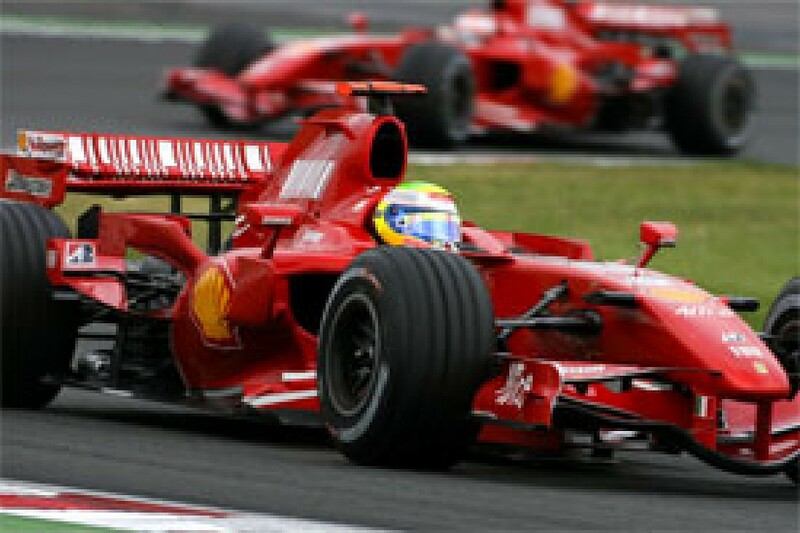 Alonso hounded the German at every possible opportunity, trying a string of moves down the outside into the hairpin, often running extremely wide as he braked unfeasibly late to try and unsettle Heidfeld. Then on lap 33, Alonso got a better run out of the 180 and drew alongside Heidfeld approaching the daunting Imola chicane - hardly a passing place in normal circumstances. But Alonso held his line, claimed the corner, and left Heidfeld to skitter across the run-off area. It was a timely reminder of Alonso's overtaking prowess, but would gain him little, for both McLarens came in for their second stops four laps later. With little to lose and all the cars around him on two-stop plans, Alonso was fuelled to the finish. To make the plan work, he had to lap faster than the likes of Heidfeld and Fisichella while carrying more than 20 laps' additional fuel, and it proved impossible. He also made some costly errors, with a wild sideways slide that left him just skirting the edge of the gravel at Estoril indicative of how hard Alonso was pushing, and how forlorn his chase would be. When Heidfeld and Fisichella made their final pit stops on laps 47 and 50 respectively, both rejoined ahead of Alonso once again, and although he tried a few more outside line moves on the Renault at Adelaide, the world champion could not pull off any more bold passes in the final stint. Hamilton had remained on a three stop strategy and rejoined wheel to wheel with Kubica. Both men had one more stop to make, but despite the BMW pulling ahead onto the long straight, Hamilton managed to get down the inside into Adelaide and quickly pulled away, ensuring that he could stay ahead of Kubica when both pitted for the final time. That guaranteed Hamilton third place, but the loftier steps on the podium were far out of his reach, as the McLaren's slightly inferior pace and additional stop left it half a minute behind the all-Ferrari lead battle. 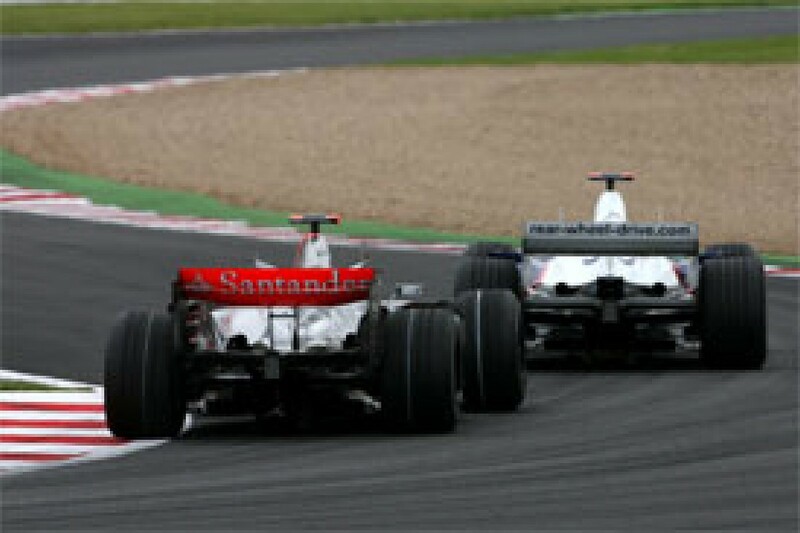 In contrast to the first stint, Massa was unable to pull away from Raikkonen in the middle of the race, with the Finn constantly shadowing his teammate - two seconds behind and matching his times tenth for tenth. The gap shrunk further as they picked their way through the gaggle of traffic still staring at the back of Barrichello's 11th-placed Honda, leaving Massa disgruntled. "For sure I lost the race today because of the traffic, definitely, because in the first stint I was supposed to be more than four seconds in front of Kimi, and it worked perfectly because the track was free, and I was 4.8s ahead or something," he said. "And then I came out in front of him again and then he had three laps more than me in the second stint which is supposed to be the same. "But I was so disappointed with the traffic in the second stint. I lost too much time." Massa set the fastest lap of the race just before his final pit visit on lap 43, restoring his lead to 3.3 seconds. But on his first two flying laps after the stop, the Brazilian could only manage a 1:18.2 and a 1:17.6, while Raikkonen threw in a pair of 1:16.2 laps before pitting on lap 46. Coupled with a pit lane time 1.3 seconds quicker than Massa's stop, this allowed Raikkonen to rejoin in the lead of the race. 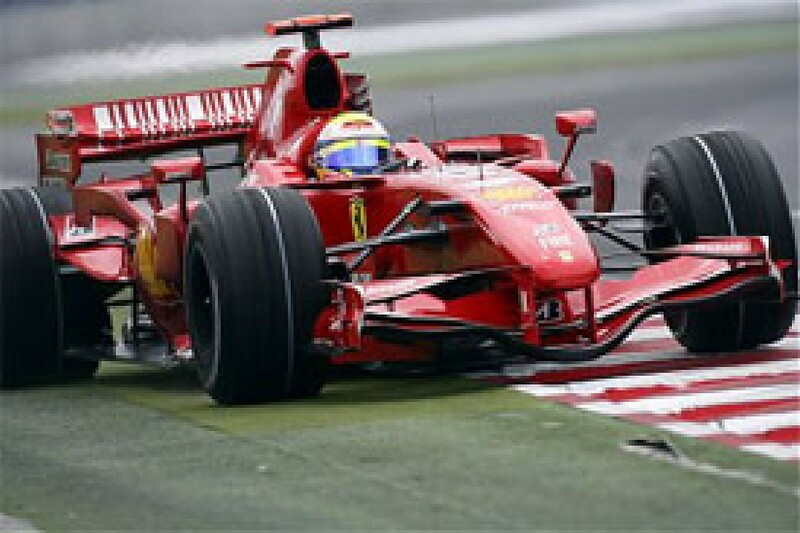 He duly reeled off the remaining 24 laps to lead home Ferrari's first one-two of the post-Michael Schumacher era. But more importantly, it was Raikkonen's first win in over three months, and his first visit to the podium since Bahrain. Behind the top three, Kubica took fourth and declared that he was feeling fit enough to "do another race now". It had been exactly the kind of uneventful, but successful, afternoon he needed after Canada. Heidfeld added to BMW's joy by completing the top five, while sixth-placed Fisichella was allowed some respite in the final laps as Alonso backed off and settled for seventh. The final point went to Button, as Honda finally had cause for optimism. The revised car was indeed quicker in race conditions, and his strategy of running until lap 32 before his first of two stops proved perfect. Button ran as high as fifth, and managed to vault Rosberg in the second stops to secure eighth. He even set the sixth fastest race lap as he closed to within 2.3 seconds of Alonso at the end. 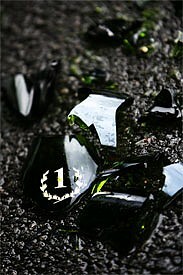 But, aware that the single point still leaves Honda ninth in the constructors' standings, Button remained realistic. "It is a good result, but we're not going to get too excited about it - it's still one point," he said. "We want to be at the front, so there is a long way to go. But if you look at the race pace today, it was pretty good." Barrichello made less progress, losing at least half a second per lap to Button early on while running just one lap heavier. "I was quite heavy on fuel for my opening stint and I don't know if that hurt my first set of tyres because I just didn't have any pace in the car," he said. However, despite having Schumacher, Webber, Coulthard, Wurz, Speed and Sato queued up behind him in the opening stint, Barrichello managed to keep all his pursuers at bay and then pit last of all, meaning that he remained ahead of all bar Schumacher - who slipped ahead during the first pit stop sequence and therefore claimed tenth, behind Rosberg. In the second half of the race, Barrichello's speed improved and he was able to inch away from Webber, Coulthard and Wurz to take 11th. Speed stayed with this group until a gearbox failure struck on lap 55, while a poor first stop dropped Sato away from the pack and the Super Aguri lacked the speed to recover. Kovalainen could not produce much of a comeback charge, largely thanks to having to back off to be lapped by the leaders as early as lap 12, so great was his early delay. He passed the Spykers and Super Aguris, and got amongst the Barrichello crowd fleetingly by virtue of stopping later. 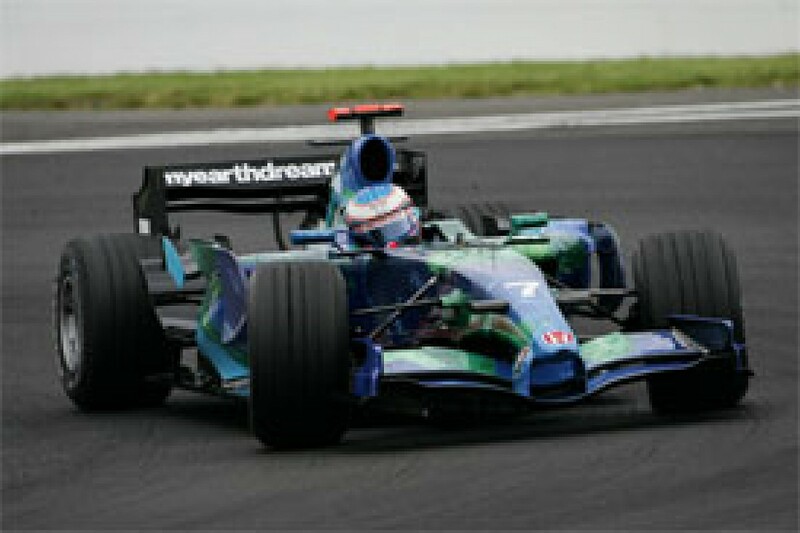 The Finn managed a wheel to wheel dice with Wurz that saw both cutting across the Nurburgring chicane, but he then had to make his final pit stop and lost touch with the midfield again, finishing 15th, ahead of Sato. Spyker's scruffy race left team boss Colin Kolles fuming. Sutil caught and passed Albers early on, but then lost radio contact with the team and consequently came in for his first pit stop moments before Albers did likewise. The crew managed to service Sutil rapidly and Albers only lost six seconds waiting, but then the Dutchman pulled away from the box before the stop was completed - wrenching the fuel hose from the rig in the process. Thankfully there was neither a fire nor injury to the crew, and Albers retired on the exit of the pits with the hose still draped across the back of the car. To compound the team's misery, Sutil managed to incur a pit lane speeding penalty in the middle of the chaos... He finished 17th and solidly last. "I am not happy and we have to learn from the mistakes that were made today," said the unimpressed Kolles. McLaren's dominant run comes to an end, with several glitches interfering with their weekend. Hamilton's engine shuts down on Friday morning, while Alonso misses virtually all of third practice with a brake sensor problem then has a gearbox failure at the start of Q3, consigning him to 10th on the grid with a far lighter fuel load than he would want in such a position. He gains ground early on with some fine passes, but the switch to a two-stop strategy leaves him hamstrung on heavy fuel for the final 33 laps and he ends up seventh. Hamilton qualifies second, is passed by Raikkonen off the line and then falls out of contention by sticking to a three stop plan. Maintains his podium run and the points lead with third, but is half a minute behind the Ferraris. Real signs of progress as Fisichella and Kovalainen share row three on the grid, despite the Finn having an inconvenient power steering problem in Q3. His race is ruined when Trulli hits him on the first lap. He has to wait for the field to pass, then pit with a puncture, and can only recover to 15th. Fisichella battles with Alonso and Heidfeld all race, losing out to the BMW in the first stops and lacking the pace in the middle stint to retake the place despite running longer at the second stops. He fends off Alonso to earn sixth. Ferrari signal their return to form by dominating Friday practice. Massa then takes pole with Raikkonen third, with the Finn passing Hamilton at the start. A dominant one-two duly follows, but there is a surprise change of order at the final stops as Raikkonen makes excellent use of three extra light-fuel laps to jump ahead of Massa and secure his first win since March. There is little sign of the promised improvement in practice or qualifying, with Button and Barrichello 12th and 13th on the grid. But Button is much more competitive in the race and makes his long first stint work superbly to run as high as fifth and get into contention for points. Passes Rosberg for eighth in the second stops and even catches Alonso at the end. Barrichello is far less comfortable with the car in the race than his teammate, and has a queue of traffic behind him for most of the afternoon. Finishes 11th. Kubica breezes back into the field in fine style. Despite losing most of first practice to steering problems, he qualifies a career-best fourth, and holds the position throughout the race. Recurring back problems on Friday threaten Heidfeld's participation in the race, but treatment eases the pain sufficiently for him to continue. He qualifies seventh and emerges on top of race-long battles with Fisichella and Alonso to finish fifth. Trulli qualifies eighth, with Schumacher showing more signs of improvement in 11th. But for the second race in succession, a Toyota triggers a first lap shunt - with Trulli running into Kovalainen this time. The Italian has to retire. Schumacher is trapped behind Barrichello until his first pit stop, but gets ahead of the Honda during the pit sequence. He doesn't have the pace to catch the points battle and finishes a solitary 10th. Coulthard sets some excellent practice times, but reliability remains an issue, with transmission issues for Webber in practice and an oil pressure problem leaving Coulthard 16th on the grid. Webber only manages 14th. They have uninspiring races in the queue behind Barrichello, finishing 12th and 13th, Webber ahead. Rosberg flies in practice and takes ninth on the grid, while Wurz is 18th after again failing to get to grips with qualifying. He is soon stuck behind Barrichello and the Red Bulls in the race and finishes 14th. Rosberg battles with Alonso early on and keeps the Fisichella/Heidfeld/Alonso contest in sight at first. But he loses touch later in the race and is passed for eighth by Button at the final stops. Speed and Liuzzi readily admit that their third and fifth places in Friday practice were achieved on very low fuel. They return to a more customary 15th and 17th in qualifying. Liuzzi's race is soon over thanks to a first corner tap from Davidson, but Speed shows promise again as he runs with Barrichello, the Red Bulls and Wurz until a late gearbox failure. Albers and Sutil are slowest in qualifying again, and then the German has to start from the pit lane thanks to an electrical problem on the dummy grid. He catches and passes his teammate in the race, then causes pit lane confusion by stopping just when Albers was due. He is serviced without drama, but Albers tries to depart the pit too soon and takes the fuel hose with him. No-one is hurt, but the Dutchman is out. Sutil picks up a pit lane speeding penalty and finishes 17th. Davidson's ninth place on Friday afternoon hints at another promising upper midfield performance, but the team soon fade. Sato and Davidson only qualify 19th and 20th, with Sato then dropping to last thanks to the penalty carried over from Indianapolis. He passes Albers and Speed early on, then joins the group chasing Barrichello, but falls away with a slow first stop. He finishes 16th. Davidson hits Liuzzi at the start and is violently collected by the spinning Toro Rosso. Pre-race: Adrian Sutil, 21st in qualifying, fails to leave the grid for the formation lap. Lap 1: On pole position for the fourth time this season, Felipe Massa makes a flying start as fellow front-row qualifier Lewis Hamilton drops to third, behind Kimi Raikkonen. Robert Kubica annexes fourth, from Giancarlo Fisichella and Nick Heidfeld. Jarno Trulli barges Heikki Kovalainen into a spin at the hairpin: the Finn pits for repairs at the end of the lap, Trulli hobbles in to retire. Nico Rosberg completes the lap in seventh ahead of Fernando Alonso, Jenson Button, Rubens Barrichello, Ralf Schumacher, Mark Webber, David Coulthard, Scott Speed, Alex Wurz, Takuma Sato, Christijan Albers and Adrian Sutil, who starts from the pits. Anthony Davidson and Tonio Liuzzi collide on the approach to Turn Two: Davidson spins and retires to the pits while Liuzzi remains beached in the gravel. Lap 2: Massa leads by 1.4 seconds. Alonso passes Rosberg. Lap 4: Massa leads by 2.2 seconds. Wurz passes Speed. Lap 5: Alonso passes Heidfeld for sixth but can't make the move stick. Sato passes Speed. Lap 8: Massa laps in 1:16.623 to stretch his lead to 3.4 seconds. Lap 9: Massa posts a 1:16.523. His lead extends to 3.6 seconds. Lap 12: Massa goes faster again: 1:16.398. He leads by 4.0 seconds. Third-placed Hamilton trails Raikkonen by 1.9 seconds. Alonso remains bottled behind Heidfeld. Lap 14: Both Ferrari drivers set personal bests: Massa a 1:16.341, Raikkonen a 1:16.611. The gap is 4.3 seconds. Lap 15: Massa laps in 1:16.229, Raikkonen in 1:16.524. Lap 16: Both McLarens pit, but they are far enough apart for it not to be an impediment. They rejoin seventh and ninth. Lap 19: Massa, Kubica and Fisichella pit. Raikkonen leads. Sutil passes Albers. Lap 20: Raikkonen posts a 1:16.207. Rosberg pits. Lap 22: Raikkonen and Heidfeld pit. Alonso attacks Fisichella but the Italian holds him off. Massa resumes the lead. Lap 23: Alonso passes Fisichella. Lap 24: Massa leads Raikkonen by 2.0 seconds. Hamilton is third from Kubica, Button (yet to stop), Heidfeld, Alonso, Fisichella, Rosberg and Barrichello (also yet to stop). Lap 28: Alonso gets alongside Heidfeld, but there's no way through. Wurz pits, as do both Spykers. Albers rejoins with his fuel hose still attached and pulls off at the pit lane exit. Lap 30: Webber and Speed pit. Lap 32: Alonso briefly gets ahead of Heidfeld again, but runs wide and has to slot in behind once more. Button and Coulthard pit. Lap 33: Alonso finally passes Heidfeld. Barrichello pits. Lap 34: Alonso posts a 1:16.819, a personal best: the Ferraris are lapping in the 1:17/1: 18 as they negotiate traffic. Sutil pits. Lap 35: Half-distance. Massa leads Raikkonen by 1.2s with Hamilton a further 6.1 seconds adrift. Lap 36: Alonso posts a 1:16.495. Lap 37: Hamilton pits, as does Alonso. Lap 38: Hamilton is overtaken by Kubica as he rejoins, but he repasses the Pole at the hairpin. Lap 39: Alonso runs wide off the track, but only briefly. Lap 40: Massa leads Raikkonen by 2.6 seconds. Sato pits. Lap 42: A new fastest lap for Massa: 1:16.099. Lap 44: Raikkonen leads Massa by 21.6s seconds. Hamilton is 9.3 seconds adrift of the Brazilian. Lap 46: Raikkonen pits - and rejoins just ahead of Massa. Rosberg, Webber and Sutil refuel, too. Lap 50: Fisichella and Button pit, as does Wurz. Lap 51: Hamilton makes his third fuel stop. Barrichello, 11th, also pits. Lap 52: Schumacher and Speed pit. Lap 56: Raikkonen leads Massa by 2.8 seconds. Hamilton is now almost half a minute adrift, and well clear of Kubica. Speed pulls off to retire. Lap 60: Raikkonen leads by 1.8 seconds with 10 laps to go. The closest battle is between Fisichella and Alonso, who are tussling for sixth. Lap 70: Raikkonen scores his second win of the year, 2.4 seconds clear of Massa. Hamilton records his eighth podium finish in as many races. 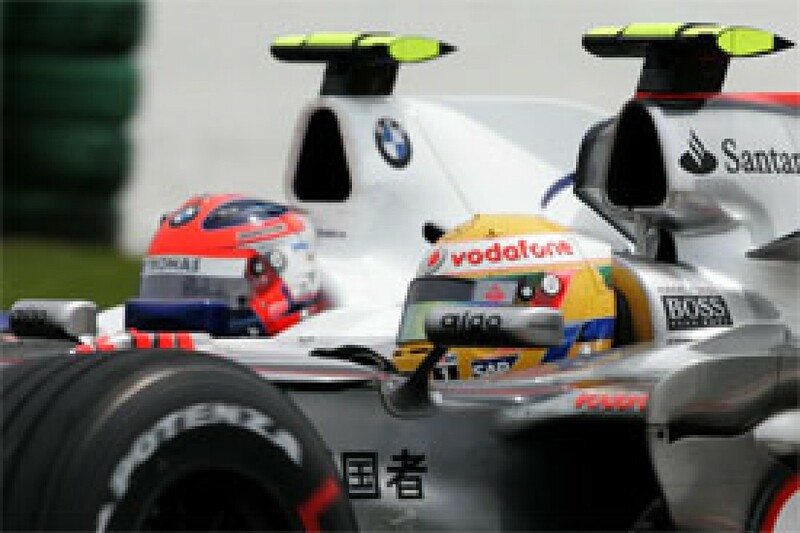 Kubica, Heidfeld, Fisichella, Alonso and Button, who scores Honda's first point of the campaign, complete the top eight.